Peñasquitos Lutheran Church (PLC) Connecting people to Jesus and one another. Invite A Friend To Alpha! What Do We Believe About the Bible? 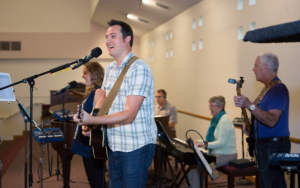 These two services features current Christian music led by a full vocal and instrumental ensemble. Holy Communion is celebrated on the first Sunday of each month. During the school year, there is a special “Family Worship” time at the beginning of the 9:30 am service each week before children are dismissed for Sunday School. Childcare is available for children up to age 3 in the nursery. Adult Sunday School is offered during the 9:30 am hour. Socializing, coffee & donuts are in the Fellowship Hall after each service. A parents’ room is available in the back of the sanctuary for those moments when a child’s behavior may be disruptive. Listening devices and large print bulletins are available. © 2019 Peñasquitos Lutheran Church (PLC). All Rights Reserved.